We all like playing games and winning in them. What we like more is not to work hard but to win a lot. Slots may be one of the games which allow you to so that! There are so many different slots types for any taste and with different amounts of winnings. You can play classic three-reel slot with the fruit symbols or a Wild West video slot. Now you can choose whatever you want as the technologicl development never stops and every day there is something new to see and fresh to play. Although there are different slots variations, there is the main difference between them all. Classic and progressive slots attract lots of players but not everyone knows what these types can offer. So much in common but jackpots are so different. Well, it seems that every slot player imagined himself hitting a huge jackpot. If you have not hit it at once, you should play some time more. Pretty overwhelming. But what is the difference between classic or regular slots (slots) and progressive slots? Progressive slot machines are connected with each other and that is how the network of the slot machines is created. They are known for constantly growing jackpots. The jackpots are growing due to the percentage taken from each spin of the each machine. It keeps growing until someone hits it. As they are connected, every player that plays at one of the machine has a chance to hit the largest jackpot. And certainly there are different variants of the progressive slots. The non-progressive machine is not connected to any other machine. The jackpot is growing due to the played coins. Some percentage is taken for increasing jackpot. You can recognize it as it has a meter on top, which is counting the total jackpot. Usually jackpots in such machines are lower than in other progressive machines as the pot rises within one machine. This kind of progressive slots represents a group of connected slots, which are owned by one casino. They can be located in several casinos, if the proprietor owns all those casinos. The jackpots are higher in these machines but still there is a good chance to win jackpot. These are slot games, which give human really huge jackpots. If someone hits such kind of jackpot, the life changes dramatically. Usually the machines are located in different and totally unrelated casinos. They are managed by an operator, not a single gaming provider. 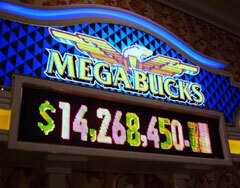 It is really difficult to win such a jackpot, as the operator and the casino take some percent from each spin. Certainly, you can try this kind of slots. It is so exciting to play such machine! But you should keep in mind that your chances are extremely small. You should take it as a rule to play such machines. In case you really want to win a jackpot, you should check out and take a closer look at the Stand Alone machine. These machines are available online from where anyone is able to take part in the jackpot slots at any time. The casino offers 19 progressive jackpots that are put up for grabs each and every day of the year. Beach Life casino slots games are able to garner a player up to seven digits range everyday, a lucrative payout that cannot be found in any other slots from other casinos.